During a broadcast on Sunday, the South made note of the solider’s pre-existing health conditions while criticizing the North, which struggles to feed its people and provide adequate health care services. The loudspeaker broadcasts serve as a kind of psychological warfare as the North tries to keep outside information from trickling in. Yonhap News, citing military officials, reported that North Koreans within 12 miles of the border are able to hear the speakers. North Korea’s capital, Pyongyang, has not addressed the soldier’s defection. In the past, the regime has blamed defections on Seoul either kidnapping them or enticing North Koreans to flee, The Associated Press reported. 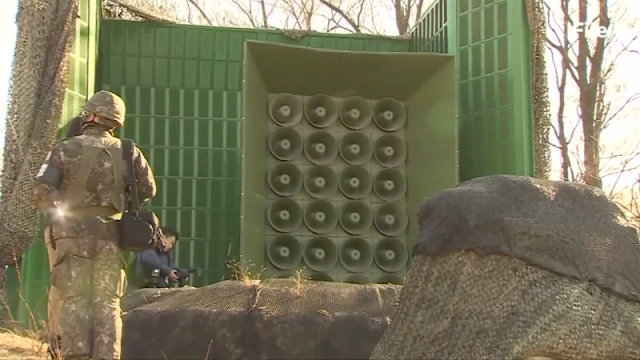 South Korea has been blasting its view of events across the border since January 2016, when North Korea performed a nuclear test, ending a truce the two countries had reached to stop the broadcasts. Before that, South Korea briefly switched on its speakers in response to landmine explosions that maimed two soldiers, which it blamed on North Korea, according to AP. On Thursday, a South Korean surgeon treating Oh said he is recovering well, though still has a lot of work ahead of him. “He’s quite a strong man,” lead surgeon John Cook-Jong Lee told Reuters, adding that Oh will need psychological treatment as well. Lee said he has asked senior South Korean military officials to hold off questioning Oh while he recovers. 0 Response to "South Korea Trolls North With Loudspeakers Blaring News On Defector"